You know, it's easy to get incensed about people with horses who clearly don't know anything about how to take care of them, especially in this era of instant information. The horse rescue outfits are dreadfully busy and some people should be horsewhipped (pun intended). But our modern standards of horse care have very little to do with historical norms or the awfulness recorded so well by Anna Sewell in "Black Beauty." The difference doesn't all come from willful neglect, mindless cruelty, or indifference. Bear in mind that simply loving animals does not bestow knowledge. It is possible to do harm with the best of intentions, and no one person anywhere is born knowing anything about anything except how to breathe, eat, and excrete. Our knowledge as horse people comes from hands-on working with horses, learning from others (both the good and the bad), and hopefully, being exposed to mentors who can teach us what we don't know. 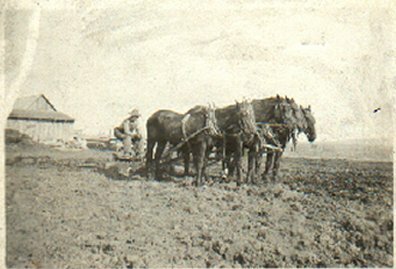 My great-grandfather's team at plowing time. My father's immediate family didn't own horses when he was a child (his grandfather did), though my mother's father farmed with horses throughout her childhood. Funnily enough, it was Dad who wanted horses and Mom who didn't care much for them, though she made an effort (sometimes painful) in order to keep up with her horse-oriented family. Dad bought our first mare, Lady, basically to pack out game when he went hunting every fall. Then a neighbor gave him a champion Saddlebred stallion the neighbor couldn't control, and we happily bred both half-bred and purebred Saddlebreds for years, all of whom grew up to be exceptional horses that would go anywhere and try anything. Dad became a good farrier, and our horses were well-fed and saw a vet when required, but initially, things like annual worming of our beasts went by the wayside simply because nobody in his horse-owning circle of hunters and farmers knew about such things. The horses seemed healthy enough, so what else was there to know, eh? When I was six, new neighbors moved in next door with a bevy of Tennessee Walking Horses that they showed at a very high level. Our two families quickly bonded, in some cases becoming inseparable. And, naturally, knowledge filtered both ways. Dad broke out several of their young horses and taught them useful, non-show ring lessons, and some tactful observations from the neighbors' direction led to higher awareness on our part. One result was an annual battle with horses reluctant to choke down the old-fashioned, yucky-tasting powders that used to be the norm for worming (thank GOD for paste wormers). We learned how to bathe and clip our horses for 4-H shows and keep them looking smart. Though all of us kids were natural little centaurs, we learned to be kinder in our control and appreciate that there was a thinking creature at the other end of the reins. And as we grew up, we became conscious horsemen, actively seeking to learn more. I adore organizations like 4-H and Pony Club that teach youngsters not just how to ride, but how to care for and train their horses appropriately. This evolution of knowledge is natural, desirable, and echoes the long, slow accumulation of horse lore through the ages. The culmination in the 21st century is a vast body of knowledge but also a certain amount of craziness. The oft-times silly coddling of horses kept in stable environments was a revelation to the adult me the first time I was forced to board my horses somewhere besides the pasture. The hairy, hardy beasts of my childhood were a far cry from the shaved, blanketed, wrapped, and neurotic critters in those expensive paddocks. The majority of horse owners of yore were not likely much more savvy than we were back then, and their treatment of their beasts may have been unintentionally cruel. When the peasant lives in a hovel, do you really think his animals are going to live in the Ritz? Windows in barns and byres just weren't the norm because putting them in involves construction techniques that are not necessarily easy to master for the average do-it-yourselfer. Enclosed stables were safer from predators as well, so the door was the only opening, carefully barred at night. Fresh air and light were therefore not part of a stabled animal's existence for centuries. While much fiction speaks of grooms mucking out the stable, how often are they shown doing it? And how many readers understand why you need to do it? Do you have any idea how much poop the average 1000-pound horse produces? About nine tons per year. Each. Multiply that by the number of beasts in the stable, and "groom" must have always been an easy job to get. Now add in the billions of flies hatched in horse manure (they settle all over fresh horse manure within a few minutes of deposit). Direct observation of this phenomenon should have encouraged any horse owner to try and stay ahead of the problem. But did they? Yes and no. They tried. They had to. 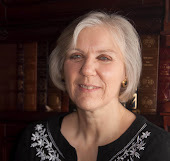 Think about the enclosed spaces of popular fantasy and historical fiction: castles, walled towns, mews, etc. There is no room for a huge "skip" of used hay and straw. It has to be disposed of before the poop gets too deep to get through the door. In London, lordly stables convenient to the Thames tossed it all in the river. Others carted it out to fertilize the local fields. For lesser folk, mucking the byre may have depended on the availability of time and hands to do it. You would think that with horses standing in a foul-smelling slime of dirt, urine, ground-in manure, and straw, it would not take long for reasonably intelligent folk to make the connection between sick horses, rotting hooves, and dirty stables. Yet horses were still dying in droves of fly-borne and other communicable equine diseases all the way to the 1920s and the end of the horse era. Enlightened observers may have figured it out--faster, I think, among horsemen who really needed their animals every day than among medical practitioners trying to control "humors" of the body. How long did it take for human medicine to make the connection between typhus and poor sanitation? (Here's a clue: More soldiers died of typhus and dysentery than of bullets in the American Civil War. Yet cavalry manuals called for strict stable management and clean straw.) So go figure. Our ancestors were ignorant, not evil. There is no excuse for poor stable management in this day and age, and no excuse at all for brutality, but when writing about less enlightened times, try to remember the general level of knowledge, the constraints on the human owner, and the attitude of the times that considered horses interchangeable machines, not beloved (if expensive) pets. Compassion toward animals did not become a concern or a trend until the mid-19th century, which leaves an uncomfortably long stretch of history in which the number of people who thought twice about beating a horse to death was vastly outweighed by the number who didn't. The casual cruelty of the horse owner who was himself one step away from starvation shouts aloud of the age he lived in--and should be reflected in your worldbuilding. For a pretty good article discussing the problems of horses in urban environments, try this one.